The original of the picture shown above has come into the possession of your columnist without any mention of the date or the identity of the men and boys shown in it. 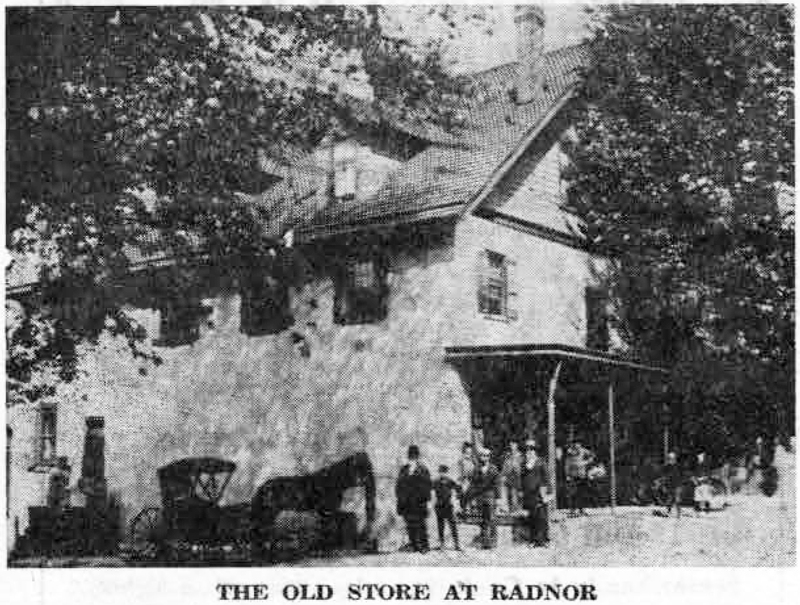 There is a notation, however, that the house was called the Dillin Store, which places it approximately, as the present Old Store at Radnor was sold to Oscar Dillin by Effie G. Yarnall, of Philadelphia, about 1880. Mr. Dillin operated the store for some ten years with the help of his brother, John Dillin, an authority on rifles of that period, and had himself designed one. After he bought the original building, Oscar Dillin built an addition to what in the early days had been the Old Red Lion Inn. The exact date of its building is not known, but in the old deeds, mention is made of the sale of a “tavern and tenements” in 1842. 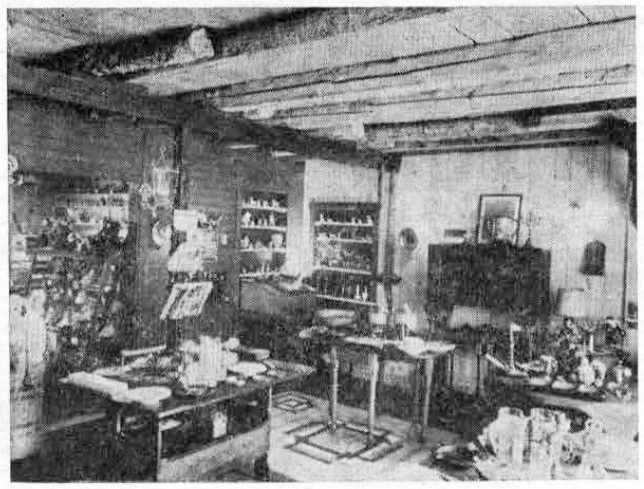 Mr. Dillin sold a large variety of articles, in addition to feed and grain, which were unloaded at the narrow door seen at the side of the building, just back of the quaint old horse-drawn buggy in the picture. One of Radnor’s old time residents still recalls Mr. Dillin’s pleasant way of giving as much of his time and attention to the small boy or girl, with a few pennies to spend on peppermint candy or lemon sticks, as he did to his adult customers. And this same old timer still remembers how delicious these candies were. Merchandise in the store included such staples as flour, sugar, syrup and molasses, as well as scrapple in season. Calico by the yard was also sold, and some articles of clothing. Kerosene was a staple, since candles and lamps were then the only means of house illumination available in rural districts, and the old timer reminds us that each lamp chimney had to be washed and polished after every using. A map of Radnor, dated 1873, shows that Dr. G.P. Sargent then owned the large piece of property to the north of the Dillin store, later the location of the Casson Riding Academy. Next was a small white stone house, shown in the picture below, occupied by a Mrs Thomas and a Mrs. Blanchard. It is one of the earliest homes built by the Welsh settlers. In this small edifice the service of St. Martin’s Church was held in 1879. With its trim exterior and fresh paint, the little house is a quaint and attractive one at present. Next on the north, as shown on the 1873 map, is one of the earliest school houses in Radnor township, attended by many of its young people in days gone by. This is now Ryan’s gas station. Adjacent to the school house was the home of the Shea family, on what is now the northeast corner of King of Prussia road and Glenmary lane, although at that time the lane was not in existence. The Shea house has since been demolished, and on its site is the Sunday school building of St. Martin’s Church. 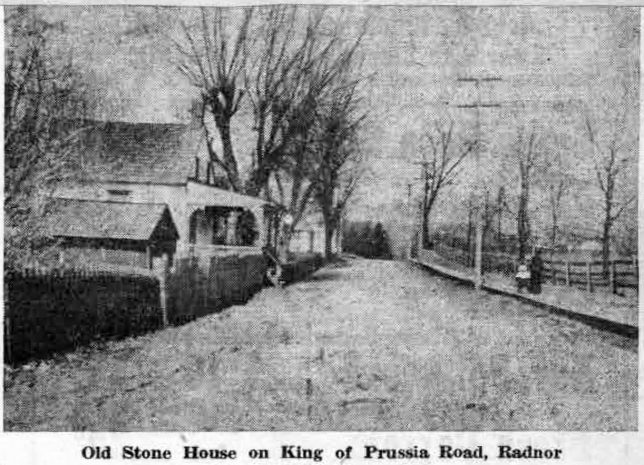 As the original owner of this old picture gave it to your columnist recently, he nostalgically recalled the days in the 1880’s when teamsters, coming along the old King of Prussia road, would rein in their horses, rather than disturb a mother hen and her brood in the middle of the road. Now the automobile traffic on the old road is never ceasing, a far cry indeed from the days of the horse drawn vehicle. At that time $3750 bought “the two story messuage or store-house, stone stable and other buildings thereon erected, situate in the Township of Radnor aforesaid bounded and described as follows…” The ground was approximately that now occupied by the Old Store and Radnor House. It is interesting to note that “the said Theodore F. Ramsey hereby expressly covenants and agrees… that neither the said Theodore F. Ramsey nor his heirs nor assigns holding said lands shall at any time hereafter forever erect or maintain any building for the sale of intoxicating drinks, nor suffer any intoxicating drink to be sold in any building on said premises.” This seems a far cry indeed from the days when the present Old Store was the historic Red Lion Hotel and a gathering place for convivial souls of the neighborhood! According to the next deed, these same premises were sold a year later by Theodore F. Ramsey and Sallie, his wife, to Effie G. Yarnall, “of the City of Philadelphia,” for $7,500, exactly double the price paid by Mr. Ramsey. The third old deed in the possession of Mr. Thomas is one of lesser importance, having to do with the sale of additional land in 1884 by William W. Montgomery and Theodore D. Rand “and wives” to this same Effie G. Yarnall. Interesting as these three deeds are, they are antedated by almost 200 years by the record of a grant of land made by the government to one David Davis, the first owner of the property on which the Old Store stands. This was in August, 1695, five years after the original grant of 50,000 acres was made by Charles II of England to William Penn. In 1681, a Richard Daves (or Davis) obtained 5,000 acres of these 50,000 from Penn. These Davis holdings were in what is now the Ithan section of Radnor township, and it was from this Davis that John Jarman purchased 100 acres on which the Ithan Store is located, at the intersection of Conestoga and Radnor-Chester roads. Here in this old stone building, John Jarman’s son was the first male child to be born in Radnor township. Although it may be but a coincidence of names, it seems more than likely that this David Davis and Richard Davis were related, perhaps even brothers. 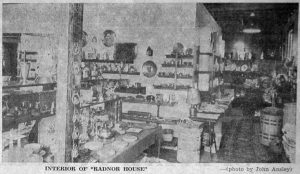 At any rate, it is a matter of historic interest that the properties on which two of the oldest stores in Radnor township are located, the Ithan Store and the Old Store at Radnor, were originally owned by men named Davis. Radnor township itself took its name from Radnorshire in Wales, whence came many of the Quakers of the colony founded by William Penn. The homes of these early Welsh man were scattered through Radnor township. The first ones were built of logs hewn from great trees in the thick forests through which the Indians were still roaming. Many of the sturdy small stone houses built shortly after, are still to be found. Two, particularly familiar to the motorists on Lancaster avenue, are located on the northwest corner of King of Prussia road and Lancaster avenue, at the Main Line Golf Club, and the other at the southeast corner of Radnor-Chester road and Lancaster avenue. With the completion of Lancaster stone turnpike in 1794, travel between Philadelphia and Lancaster passed directly between the northern and southern sections of Radnor township. 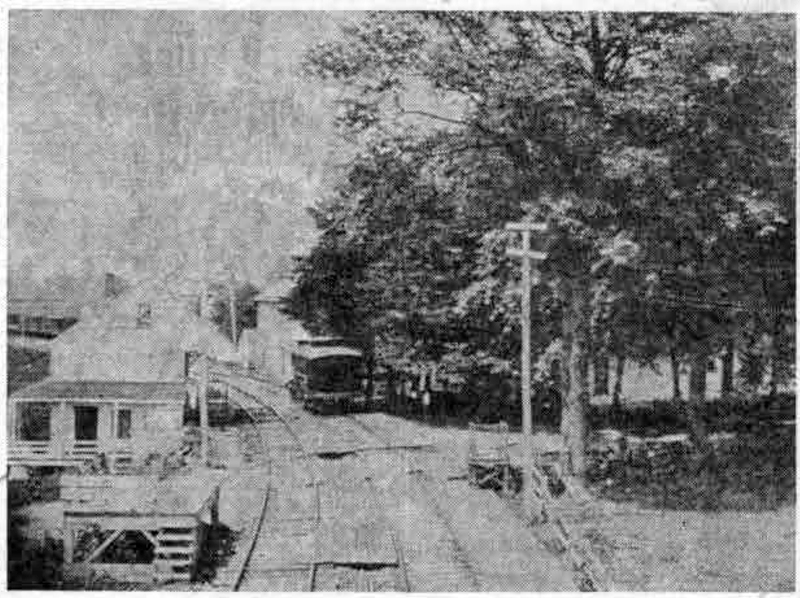 Then, with the completion of the Philadelphia and Columbia Railroad in 1820, a station was immediately located at Morgan’s Corner, as that section of Radnor was then known. The picture illustrating today’s column shows the Philadelphia and Central Railroad station at Morgan’s Corner as it looked in 1856. The road crossing the tracks at right angles is the King of Prussia road. This picture has been lent to your columnist by the Radnor Historical Society, which received it from Howard S. Okie of the St David’s Church Historical Committee. 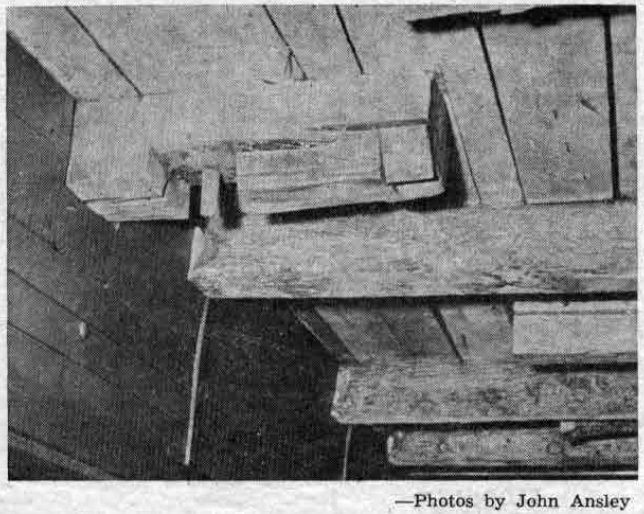 In the left foreground of the picture (right) is shown one of the square upright posts of the one-time feed and grain store in Radnor, as carefully preserved as were the ceiling beams shown in last week’s picture. Its rough exterior shows that it was hand-hewn when it was put in place some 80 years ago, and is one of the picturesque reminders of the past in the remodelled interior of the present “Radnor House” on Belrose lane. Mr. and Mrs. Paul Thomas, owners of Radnor House, designate this as the “West Room”, to distinguish it from the “Green Room”, which was part of the original structure. Noteworthy in the latter is the number of heavy hand-hewn ceiling beams held together by tongue and groove joints and wooden pins, which have been in place since the stable area was built in the 1700’s. Today’s picture shows not only the interior of the “West Room”, but also the long hallway to the right of it, previously described. We noted in last week’s column that the foundation of this building was of dry stone, in which one of the original stone ties from the old Philadelphia and Columbia Railroad had been used. Since then an interesting bit of information in regard to these ties has come to light. Original these stone blocks, which were so heavy that four men were required to lift them, were hewn by inmates of “Sing Sing” prison. When these prisoners were unable to produce them rapidly enough to keep up with construction of the railroad, wooden ties were substituted. These were to be used until production could catch up with demand, but they were such satisfactory substitutes for the heavy stone that they were retained. When the Pennsylvania Railroad acquired the Philadelphia and Columbia Railroad in 1857, much of the original track was relocated. The heavy stone ties then discarded are still to be found here and there along the Main Line, where they have been put to various uses. In July 1952, after Mr. and Mrs. Thomas bought the old stable and feed store from L. Rodman Page and William B. Thompson, they traced ownership of the tract back to August 30, 1685. According to Smith’s Patent Atlas, a grant of land by the government was made to one David Davis. By January, 1686, Davis had deeded the property to William Thomas. The latter kept it for 21 years, and in April, 1707, deeded it to Owen Lewis. Then in rapid succession it passed to Evan Jones and to Richard Orme. By 1878 W.W. Montgomery and Theodore D. Rand had acquired “a dwelling house, formerly a hotel, store and other buildings.” This property bordered the Pennsylvania Railroad and was so described. Very soon the Montgomery and Rand families had sold at least part of the property to Theodore F. Ramsay. Other families who came into ownership after that were the Yarnalls, the Dillins, the Torpeys and the Morrisons, bringing the ownership up to 1952, when Charles Morrison sold his interest to L. Rodman Page and William B. Thompson. Among these earlier names are many who have been connected with the settlement and development of Radnor. Three of the old deeds, their ink faded with time, are in possession of Mr. Thomas. One of these interesting documents dates back to 1878, another to 1879 and the third to 1874. 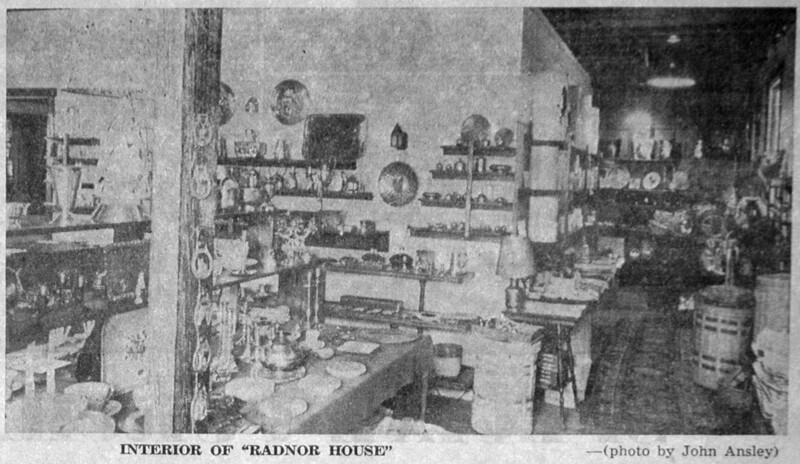 In continuing the story of the present day “Radnor House”, remodeled from the tumble-down building that stood on Belrose lane just back of the “Old Store” in Radnor, we are showing two views of the interior as it looks today. In both pictures the room is the same, the second picture showing in detail the original ceiling so carefully preserved by Mr. and Mrs. Paul Thomas when they started their work of renovation in the summer of 1952. Two years ago the one-time combination stable and feed store was a dilapidated, broken down building. There were no windows, only openings in the old walls, and a five-foot area in one of the walls had rotted away over a 20-year period of time. Parts of the building had never been painted in all the years it had stood there. On the second floor there were still some 25 tons of hay that had been stored there for so long that it was only fine powder. Half of the building had a dirt floor and, of course, there was no electricity, gas, water or plumbing. On the outside the growth of weeds was so dense that part of the building was not even visible. In what is now the parking lot, there was a small lake which required several hundred loads of dirt to fill. These were the liabilities. But there were assets, too, in the way of sturdy hand hewn beams, interesting old wooden peg joinings, hand wrought hinges and iron work, and nails of a kind that were not even made after 1820. With a certain amount of sturdy construction still remaining, it was possible, with ingenuity and patience, to do a job of remodeling that would make the old stable and feed store an interesting background for the treasures from many lands brought here later. Before any changes could be made it was necessary to do a certain amount of fundamental cleaning up. First of all, there were several hundred bats to be dispossessed. There were loads of old bottles and odds and ends of antiquated store fittings, and broken pieces of furniture to be carted away. And there were the 25 tons of hay. In the reconstruction new lumber was used only when it was necessary, thus retaining many of the old hand hewn beams. In the eastern section of the building, which a search of old deeds and records shows was built before 1800, the principal structural beam had no nails, the hand hewn log being tied together with pin and socket joints, reinforced with wooden pegs. The three-foot hand wrought strap hinges used on the doors had evidently been made by a local blacksmith. The building itself had been constructed on a dry stone foundation, and one of the original stone ties from the old Philadelphia and Columbia Railroad had been used in the foundation of an addition to this section. The room shown in the first picture is one that Mr. and Mrs. Thomas designate as the “pine room.” Less than two years ago, when they started the task of remodeling, this room still contained four horse stalls and was open to Belrose lane through these openings. The openings were barn doors with original hand wrought hinges. The floor was dirt, and the walls had no windows. Of especial interest in this picture are the long, heavy, hand-hewn ceiling beams, which show so plainly as they stretch the entire length of the room. The second picture shows part of the same ceiling in more detail. This is part of the original construction, done some time in the 1700’s. In this room were found the hand-wrought nails of a type that were not made after 1820.